Boil meat and cut into thin strips. Cut radishes and carrots into thin strips similar to the meat. Soak radishes in cold salted water for 10-15 minutes and the carrots in vinegar. 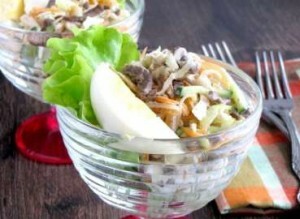 Shred cabbage and rub in salt, cut cucumbers in thin strips and finely dice boiled eggs. Drain radishes and carrots. Combine above ingredients in a large bowl,mix well with mayonnaise and season. To serve,arrange a hillock in salad bowl, garnish with quarted boiled eggs, slices of boiled meat and a spring of greens.